Because my series on biblical counseling has been so intense, I wanted to take a brief break to talk about repentance. Given some of the BCM material I will be covering in future posts, I think this topic fits in nicely. So, today, I want to talk about what repentance means and what it looks like. The problem in the Church is that people often mistake confession or apology for repentance. True, repentance begins with an acknowledgment of wrongdoing. But confession is not repentance. Neither is apologizing for offense repentance. 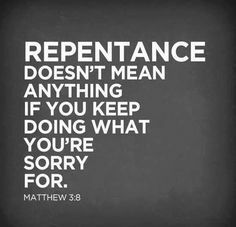 According to the Strong’s Concordance, almost anytime the word “repentance” is used in the New Testament, it means “reversal.” In other words, a repentant person will not just acknowledge his or her wrong, but will immediately reverse the wrong behavior. Also encapsulated in the Strong’s definition is compunction, or a genuine feeling of remorse for the pain that was caused by the offense. – Display a bad attitude. – Make excuses as to why he/she committed the offense. – Blame or demand that others take responsibility for their share in the offense. – Suggest that he/she may commit the offense again if certain conditions aren’t met. – Expect or demand immediate forgiveness or reconciliation based solely on his/her apology. – Whine about being persecuted or misunderstood. – Complain when forgiveness or reconciliation is not extended to him/her by a certain time. – Accuse his/her victim(s) of being unreasonable, bitter or hardhearted. – Shift focus to the flaws in others. – Use his/her status as ‘repentant’ to gain allies or draw attention to oneself. – Exude an attitude of humility and gentleness. – Take full responsibility for his/her offense without excuse. – Acknowledge the pain of those hurt by his/her offense. – Listen to and respect the feelings and boundaries of others. – Submit willingly and eagerly to constructive feedback and accountability. – Work patiently and lovingly to restore trust in broken relationships, even if that means distancing oneself for a time. – Seek help for areas in which he/she struggles. – Refrain from repeating the offensive behavior. Let me say this again: No one is obligated to reconcile with an unrepentant abuser or offender. Not only is it unhealthy and dangerous, it is unbiblical. God Himself does not reconcile with the unrepentant, even those who do works in His name. The Apostle Paul is likewise clear: “Expel the wicked person from among you” (1 Corinthians 5:13). Repentance cannot be adequately demonstrated in a 30-second come-to-Jesus chat session. Repentance is more than words; it is a complete reversal of behavior, a transformation of character. Don’t be led astray by those claiming to be repentant simply because they issued a public apology. Look for the fruit. Settle for nothing less. This entry was posted in Uncategorized and tagged biblical counseling, Christianity, forgiveness, reconciliation, repentance. Bookmark the permalink. Unfortunately, it’s the one in power that gets to decide who is in need of repentance. My family demanded all of your proper repentance actions from me. I was to have a humble attitude, admit to my offense, accept the blame for my family’s pain without excuse, submit to their advice, listen to their feelings, work on trying to fix our relationship, etc. And every time I failed or began to protest, I was being unrepentant and would be subject to more spiritual pressure and emotional manipulation. What was the offense I had committed against them? I was in a homosexual relationship. Having the right definition of repentance does little good in practice for many situations, I think. These definitions can be turned around on the victim just as easily. My family would have said that I had a bad attitude, I kept trying to shift the blame to them, etc. These definitions are just as likely to be used to harm as to help. What do you think? Yes, I have seen this happen. It is abhorrent. That’s why I focused this post on abusers – people who intentionally hurt or manipulate others (or withhold justice or charity). Your family saw your homosexuality as a personal offense to them, but they were wrong. You weren’t in the relationship to hurt or embarrass them. The fact that they felt that way and demanded change for their sake shows that the problem was theirs, not yours. But the definition is helpful for those dealing with abusers, who are told that an apology is sufficient for reconciliation. Thanks for the comment. It’s a relevant point. That’s fair. I guess that abusers demanding that victims accept their apology as sufficient for reconciliation and abusers that demand the victim themselves needs to repent do have a common theme: they tend to be the ones in power. They maybe have emotional power over the victim or authority in the church or any number of other positions that give them leverage to manipulate the victim into being helpless. These definitions are probably helpful to someone who feels pressured to reconcile, at least to accept that they are not in the wrong and they have a right to set their own boundaries. Unfortunately, as long as the church often continues to support power hierarchies, the victim will still likely be punished or shunned for bucking the system and refusing to reconcile. It’s a power problem in the end. I wish voices like yours were more listened to in the church. Then maybe I’d be willing to consider going back to one some day. That’s why I’ll keep speaking out until the Church is a safe place for the wounded. Reading this made me want to clap and sing and shout AMEN! My abusers insisted that they were reconciled with me because they’d said they were sorry I felt hurt! Therefore, I was the evil one (again!) because I “broke the power of our reconciliation, instigated by Jesus” by asking for actions to back up the words which had been spoken! That is to me the quintessential problem, the abusers claim to be “good Christians” but do not live a life I would want to emulate on any level. As my partner and I withdraw from toxic family interactions, see clearly the dances of anger and blame that we are no longer interested in playing, we simply keep our thoughts, opinions and judgements to ourselves, look at the roots of where they come from and basically turn it over to Gods judgement and be as loving as we can. Judgements hurt me, leave me with the damage, but toxicity of blame and shaming cannot be underestimated. beware of those that pretend to be sorry, don’t be sucked back in only to be harmed again….